A good garden must be a piece of art. 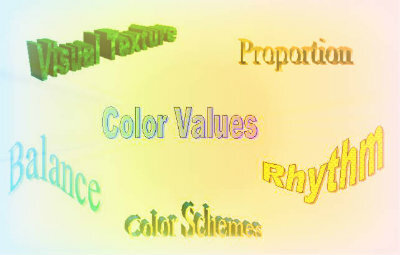 The basic principles of contrast, texture, dimension and proportion are very important to understand. 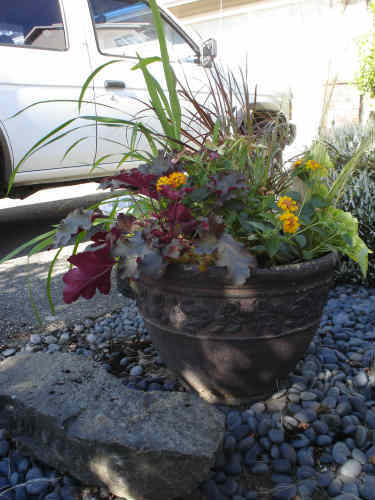 Designing a container garden with above average beauty is a snap when you've learned how to think about the choices you make for your containers! A few secrets can help you achieve something magical every time. Anyone can do it if they pay attention to a few key design ideas. Secret # 1? A clear goal! Secret # 2? Design Principles! Examples are a great way of showing how this works. 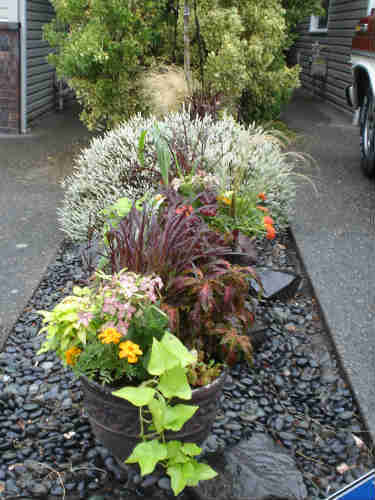 So to show you how, I am going to work with a couple of containers that I have in my driveway strip. I have resolved to change my evil ways, and recreate the beauty that once was in my forgotten strip of garden. So in preparation, I've spent a few minutes thinking through the things I want out of my garden containers. Now for a bit of an aside. 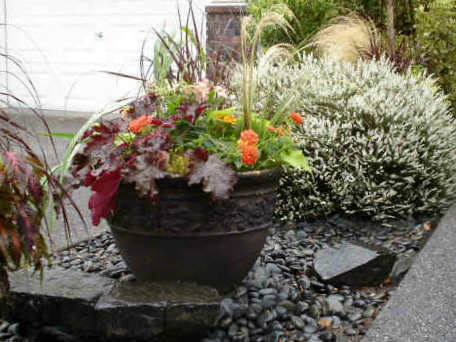 Any container garden that will remain healthy and thriving must have a solid foundation. When refurbishing or initially designing a pot it is important that the soil be new and nutritious. Always use good, healthy soil in a container…rarely will your average garden soil have the nutrition required to support plants for a long period in containers. 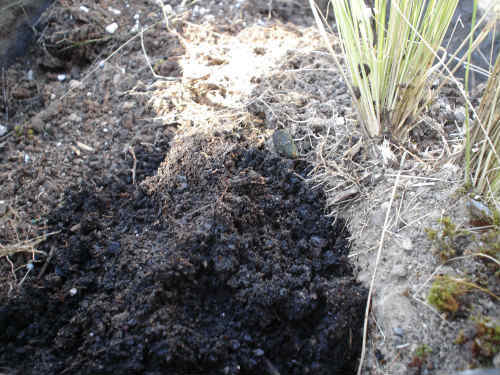 Use compost and good, well mixed potting soil to plant up your containers to keep their health. Likewise, plants that have been grown in pots often have begun to become root bound. 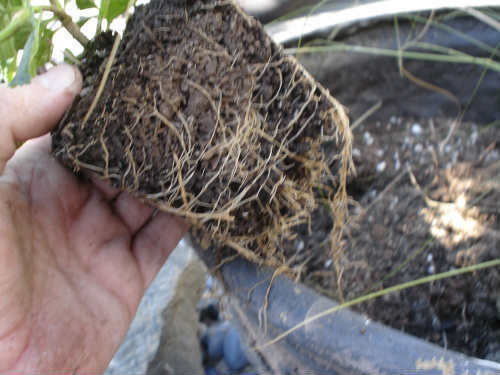 When you are removing plants from containers, always, except in the rarest cases, rough up the root system to break just a few of the roots… this allows the plant to establish roots at those broken points that will grow outward rather than continue to wind around upon themselves. Break up all the roots at the bottom of the root ball, so that they are no longer winding around the ball. Do not remove too many of the roots. At the time of this writing, it is midsummer, so I know that I need to use plants that will last well into the fall, and that will not give up the ghost in a few months when the weather turns colder. In addition, my little driveway garden is extremely demanding for the plants that make it their home. They must be heat tolerant, pollution tolerant, and able to handle very little shade. When designing a container garden at home, I suggest that you make a list of plants that will handle your conditions. This list helps keep you on track when you get to the garden center and are irrevocably drawn to all the wrong places by those pretty plant faces. Make your list of potential plants as long as possible! 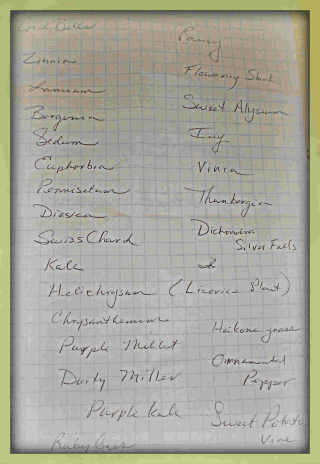 You don't know what will actually be available at the nursery, so you want to have a flexible list of ideas. Once you have your list, you can head off to the nursery (find a nursery if possible, since plants from your local hardware store are usually stressed and struggling, even if they look great. Most of the time, they've been through a lot!). We have a great nursery near us called Flower World… a practical operation with wonderfully healthy plants and few concessions to the looky-loo crowd. I headed off to Flower World with my list and a few ideas to start with. 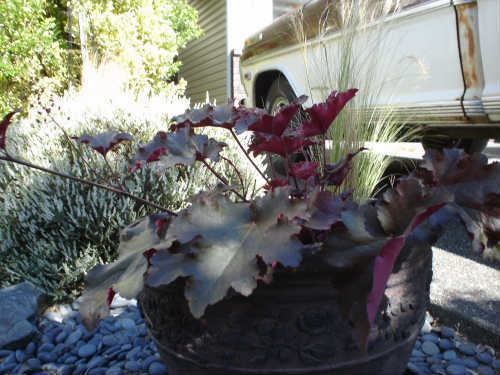 The first choice you must make when designing a container garden is to decide what you want to feature….Small or large, this plant will dictate everything you do from this point forward. 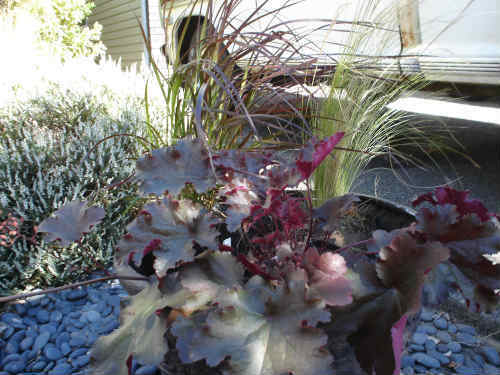 Setting off this "featured" plant acts as the goal for your container garden. One of the ideas I had was to feature a plant that I consider extra special, called 'Pennisetum aetaceum "Rubrum"'. Here is a picture of the young plant in it's pot at the nursery. 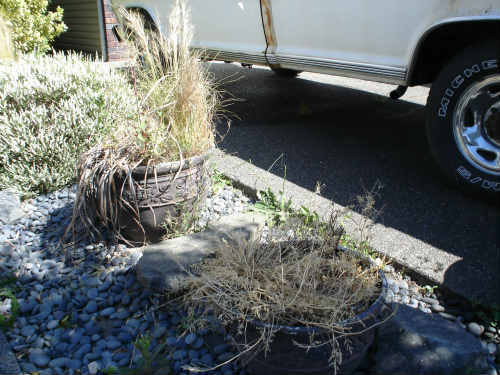 The plant is heat tolerant, drought tolerant and doesn't need shade at all…perfect for my situation…and I have used this grass before, and it is very trouble free. It is considered a tender perennial in the Pacific Northwest, where I live, but it will last long into the winter with graceful arching stems that have their own beauty. Here is what the plant looks like when it matures! I chose all the plants you will see in this article while wandering through Flower World…keeping in mind my requirements for drought and heat tolerance, as well as the lack of shade in my front garden bed. 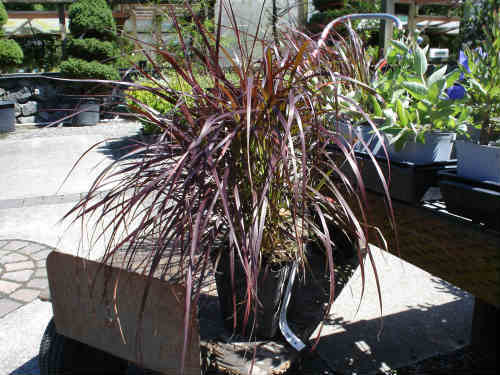 As you already know, my goal was to spotlight the purple fountain grass I love so much. I have three containers, so I chose three healthy specimens of the grass, and my first decision was made. I needed the three plants, as each of the three pots in my container garden would feature this plant, thus helping create a sense of unity (repetition!) in my garden. The fountain grass is tall, feathery, and moves in the wind nicely, so I now looked for something that complimented that grass. I love the deep purple and the cool effect of that deep purple color for my driveway garden, so I wanted to reinforce that color by selecting another plant that showcased it. I chose a heuchera called "Chocolate Ruffles". 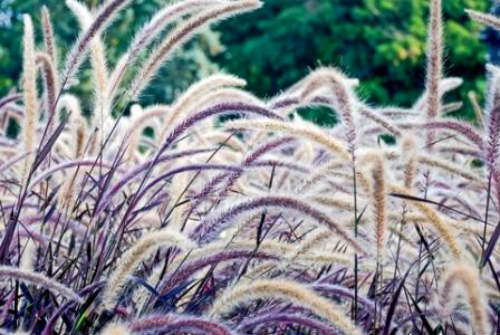 It's large purpled leaves complemented nicely the narrow vertical shape of the fountain grass, and its round, large leaves make it a showstopper. Since the heuchera is the largest plant I chose, it went into my pot first. 'Chocolate Ruffles' is nestled nicely in the first pot, and shines against the Purple Fountain Grass, so now I need to determine what is next. 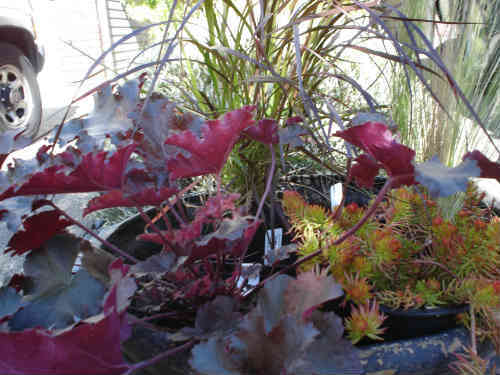 I love contrast in texture, form and color, so I wanted to choose a plant that contrasted in each of these ways. This is important when designing a container garden, as these contrasts are what bring drama and importance to your garden. My choice was Sedum 'Angelina'. I love the contrast of the golden and orange leaves of this plant with the deep purples of the Heuchera and the Purple Fountain Grass. I also especially love the texture of the leaves, and the contrast of the low growing 'Angelina' against the height of the other plants chosen so far. Now that I have the main attractions chosen and placed in my pot, I am ready to add plants that will help fill in the container. I chose to keep Mexican Feather Grass (Stipa tenuissima) that was a previous occupant of this container, so pulled away the dead grass to clean it up. It's beautiful and delicate response to wind will add movement and interest to the continer. I added two more plants that I thought would round out the container. 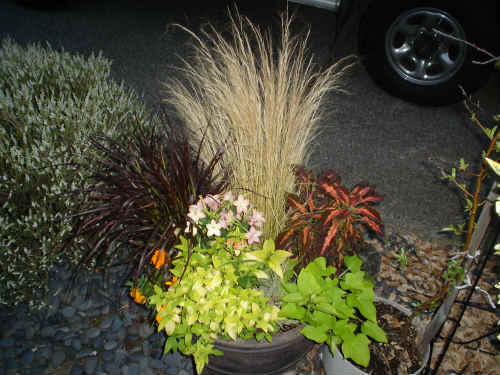 I chose Ipomoea batatas 'Marguerite' (Sweet Potato Vine) to add an additional contrast to the container, while also bridging the gap between the deep purples of the fountain grass and the golden orange tones of the sedum. The lime gold of the Sweet Potato vine perfectly bridges that gap. The other plant I added was Nicotiana 'Starmaker Lime Purple' which perfectly sets off the darker purple tones of the heuchera and purple fountain grass. Lastly, I added another contrasting color and shape to round out the bowl…in the form of the Marigold 'Safari Tangerine'. Another plant that is highly tolerant of heat, somewhat drought tolerant, and needs no shade to thrive. Now to be honest…I had a gap… and I needed another plant to finish up the pot…so I dashed to my back yard to get a plant I knew I had stashed away from having divided my crocosmia… Crocosmia montbretia…one of my favorite plants…and it is a perfect addition with its sunny orange and gold face. Here is a picture of the final container just after installation. I love the dramatic gold, orange and purple contrasts and the wide range of shapes and textures…a pot that will go on to showcase each of these plants characteristics and by late fall will be truly dramatic and eye-catching. You think you can do that? Of course you can. 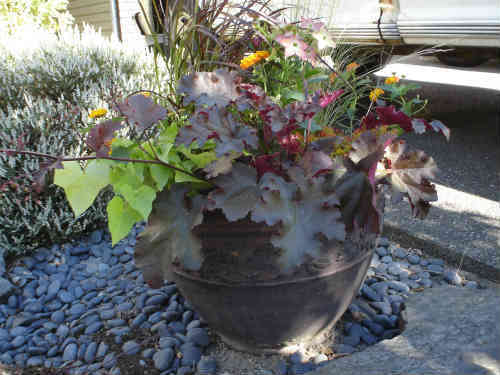 Designing a container garden is all about contrast of plant form, leaf texture and color and flower shape and color. 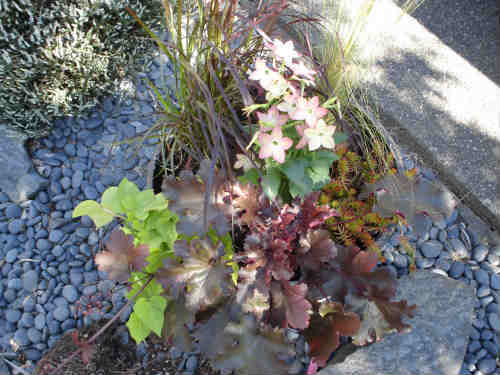 By mixing these in interesting ways, you will always succeed in designing a container garden that stops traffic. It's back to the old design principles we first mentioned isn't it? 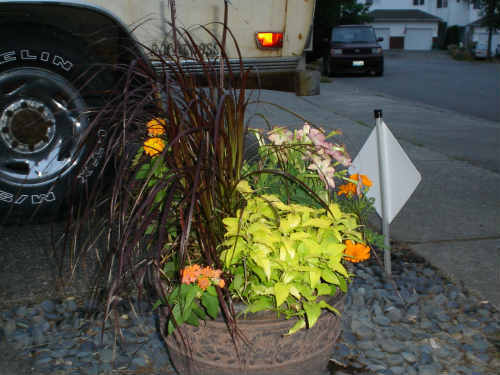 As mentioned earlier, I had two additional containers that made up my front garden bed, and each of them highlighted the purple fountain grass. I repeated the same process as above for each of them… reusing similar or the same plants as contrast, but varying them a bit too in order to create variety in the garden. To these containers, I added two additional plantings…a Cape Fushcia called Phygelius x rectus 'Sunshine' with similar lime green leaves to the potato vine, and an unnamed coleus variety. Reusing plants throughout the garden, and repeating color and form throughout creates a unified whole. My beautiful Calluna vulgaris 'Spring Cream' (heather) plant is a white…which is echoed in the nicotiana plants…bringing it into concert with the rest of the garden. The final result is beautiful now….but in a few weeks it will be truly stunning, as the plants grow together and perform natures' magic in the process. Designing a container garden that sparkles and shines is a matter of understanding the conditions of the site, the needs of the plants you choose, and of thinking like a designer as you combine your plants…look for contrast and repetition as you choose, and you'll always succeed.